This is one of those crafts that I had a hard time capturing on film. I almost didn't post it, but since it is so easy and inexpensive I figured it was worth sharing despite the poor quality photographs. We had two variations of this craft. The first was done by painting paper plates with orange tempura paint . Once the orange had a bit of time to dry JZ (5) made jack 'o lantern faces with black puffy paint using our Homemade Puffy Paint recipe. This was his favorite part. I was pretty surprised he didn't ask to make more, because he loved painting faces on his pumpkins. 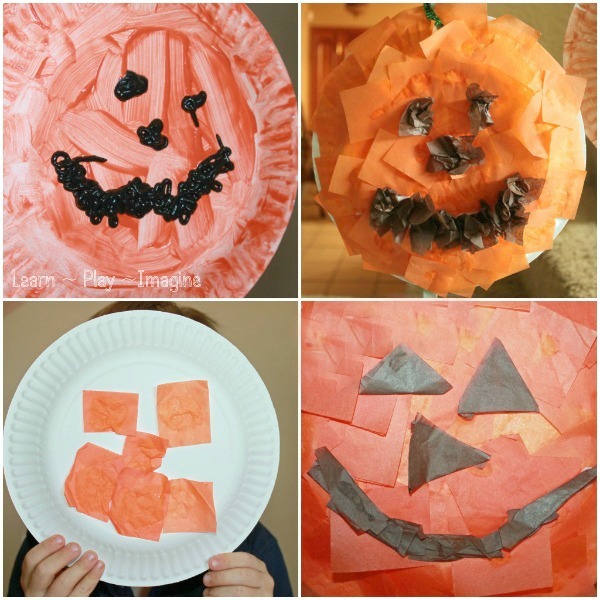 The second set of pumpkins was made using paper plates, school glue , and tissue paper squares . J-Bug (3) said his needed an eye, so I ran upstairs and grabbed a few googly eyes for him to choose from. I expected the pumpkin to turn out like the Turtle Crafts we made a few weeks ago, but to my surprise, he only used one googly eye. The finishing touch was punching a hole in each plate and using a green pipe cleaner as a stem to attach the pumpkins to our stair railing. Love how all the pumpkins turned out so different. Lovely. double love them hanging down the stairs! cute! !